I apologise if anyone is offended by this little bit of subterfuge. It's my way of getting around a problem I had trying to help out of film company in New Zealand. Yes, I put the wrong decal on - where there was none before, I hasten to add. 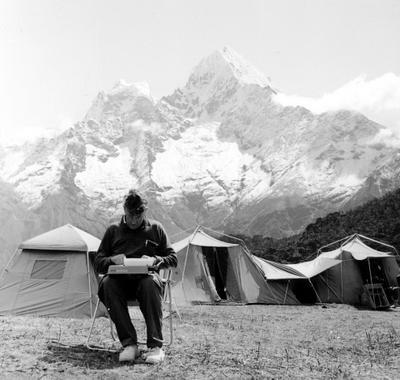 I was contacted last week by the propsmaster for a film being made in New Zealand about Sir Edmund Hillary's ascent of Mount Everest in 1953. 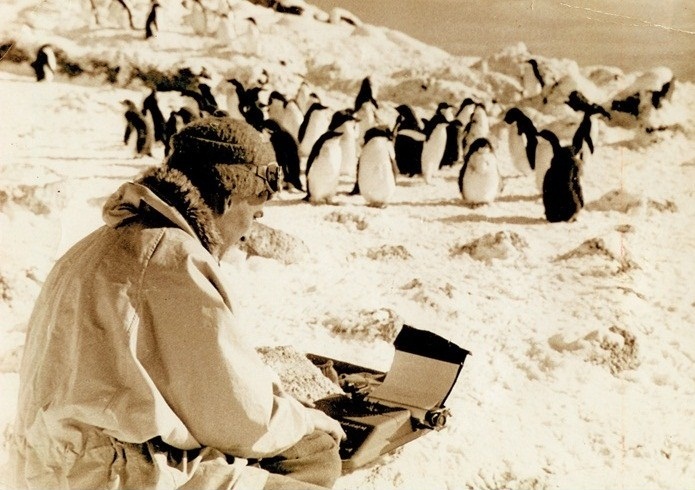 She said the leader of the successful British expedition, Sir John Hunt, documented the journey on an Empire Aristocrat portable typewriter. 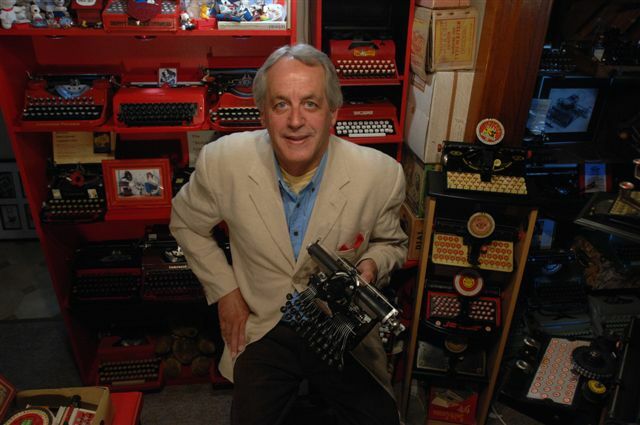 "I am trying to locate one of these typewriters for us to use on the shoot and have so far been unsuccessful ... if you are able to give me any leads on where I may be able to locate a working machine I would be most appreciative. We would of course pay a hire fee." Notwithstanding that last sentence, I was reluctant to offer one of my own Empire Aristocrats. I used to have a dozen or more of them, but generally they were in poor condition, especially the paintwork and decals - a problem that is also common to Hermes Babys of the same era. I have kept just a couple of Empire Aristocrats, which are in excellent condition, and judging by their now fairly rare appearances on Australian eBay, they must be getting a bit scarce. The red stripes have worn off, as is their wont. 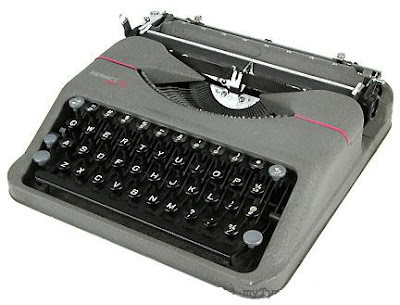 My first "lead" to the propsmaster was to point out that the grey Hermes Baby, more regularly sighted on eBay and Trade Me in New Zealand than the British Typewriter Company Aristocrat equivalent, is virtually identical. Really only the decals differ. The propsmaster was equally wary. She had bought on eBay in the US the same model of camera that Sir Edmund Hillary used on the expedition, but it got lost in the mail. The result of her being "gun-shy" about buying a Baby on eBay was a request for me to supply a typewriter. During a tidy up on the weekend, I came across a suitable Hermes Baby with no decal - but otherwise in good working order. This is my solution, as I am happy to let this machine go out of my sight to New Zealand, and to lend it to the filmmakers. I simply wasn't prepared to do that with a real Empire Aristocrat. As I told the propsmaster, "Unless you plan to film so close to the typewriter that viewers will be able to make out the wording of the decal, nobody is going to know the difference (including me) if you use a Hermes Baby instead of an Empire Aristocrat." Do you agree, or should I go no further with this pretence? I'm not actually trying to fool or misled anyone, just hoping to meet a need. You certainly had me scratching my head for a minute there. Sounds like an interesting project though! I think your advice to the filmmakers is very reasonable, and you've done a beautiful job with that decal. I see that the machine has a rupee symbol too, which would make it appropriate for use in South Asia, no? I have a beautiful 1957 Aristocrat that I found in Cincinnati (see here). Can't say I like the feel of it, but I'm considering bringing it with me for a month in London next summer because it's so compact and UK-made. Blessings from Switzerland. Where it all began. That's a coincidence. I just wrote to my friend in whom I'd incubated Hermes-envy with my recent acquisition of a couple of 3000 models. I reminded him that the Aristocrat I gave him some years ago was pretty much the same thing. Still plenty floating around eBay UK at reasonable prices. And I love the photo of the Himalayan penguins! I think that is the first Aristocrat that I've seen. I think it is neat the way that it, the Baby and my Montana all look alike.